NOTE: Kunstler Fund Director Randy Credico was present when Marion Young was sentenced to 35 years on November 15, 2001. Dowana Young, sat alone in the dank and cold courtroom, motionless, tears streaming down her forlorn face, praying to a heedless and seemingly helpless God for comfort if not answers. Thirty minutes earlier, she along with forty friends and relatives witnessed yet another legal lynching of a young black man, this time the random and unrelenting rite of southern patriarchal terrorism perpetrated on her beloved brother, Marion. A white judge, two white prosecutors, three white narcotics agents, eleven white jurors and one Clarence Thomas wannabe, collaborated in the hoisting of Marion's dreams and ambitions up the petrified oak paneled walls of the Burleson County Courthouse, a live version of To Kill A Mockingbird. Marion's wife Dowana was not in the courtroom when the verdict was announced. Naively thinking that, since the prosecution failed to prove their bogus case, Marion would be acquitted, she walked a mile to her home (if you can call it that), to get prettied up for a night of celebration with her husband, who she hadn't been able to touch for over eight months. It will be at least 25 years or maybe 99 years before that will happen again. I didn't have the stomach to face her and left before she came back to the courtroom to where she was sure she would walk Marion to East Texas' best soul food restaurant, Just Like Jeff's. Two burly white jailers had already hauled his trembling and incredulous body off to the notorious county jail. This crude location is the same spot where Mr. Young, the articulate, prolific and outspoken writer has been repeatedly beaten by thugs in uniforms. The drug war in rural Texas continues to rip apart African American families without mercy or reason and with apparent no end in sight. The elements of this particular case are only too cliche. They begin with the Independence narcotics task force (INTF), an entity addicted to federal cash. The force in staffed with tin horn cops who wouldn't know a big drug dealer if they ran the guy over in one of their brand new SUVs. If you think Tulia's Tom Coleman has a rough facade you've got to get a glimpse of Detective Tom Galloway, who is so scary I thought he was wearing a monster mask to conceal his identity. He has a string of shady confidential informants who are strung out on setting up and fabricating cases on their friends in order to stay out of state prison. Hamilton Farr is the biggest miscreant of this lot. In 1991 he pled out to assault with a deadly weapon and received 10 years probation. In 1998, after falling two grand behind in his probation payments, he met with Galloway, the detective who I suggest should wear an iron mask, to get a job as a snitch and augment his income to help defray his debt to the state. Two years passed and Farr produced no set ups. Why? One of the reasons is that Farr was selling drugs himself. In fact he sold a quantity of pot to one of the scary detective's other informants, Carlos Pena. Now, facing 10 years in prison grinding meat for Hormel, Farr had to work fast and furiously to please Detective Galloway, who I may as well call the Elephant Man. Using money from the DEA funded INTF, Farr supposedly made two buys from Young. The evidence was Farr's testimony and an audiotape that he carried in his pocket. There is no mention of drugs or money on the tape. On the witness stand Farr repeatedly lied except when he said he would do anything to stay out of a Texas pen. It is unfortunate because Farr is black and he is being used to set up other black citizens in and around Caldwell. This is how it works here and everywhere else in this God forsaken state. It's days like today that I don't feel so bad that Santa Ana wiped out Crockett and the other venal forbears of the racist Texas criminal justice system at the Alamo. One of the prosecutors, an ex-defense lawyer who wants to run for office, told me if I think this is bad go to some of the other counties down here. Just forty miles down the road 80 African American were shanghaied in another overnight drug sting. In the other direction is Hearn and we all know what happened there. That's enough. That being said, it offers no comfort for Latisha or Latanya Young. 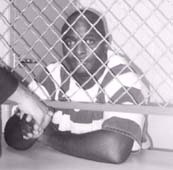 I will never forget Marion Young's eyes as he was being led out of the courtroom into the black hole of the Texas prison system. He has been consigned to a life of indentured servitude. His eyes were looking at me in a desperate search for justice. I feel so impotent. I feel so inadequate. I cried all the way back to NY.